1 BEDROOM, 1 FULL BATH: Ski In/Ski Out. Wood Fireplace. Close to ski lift. Beautiful interior. Park on one side, ski on the other. PLUS: Queen Sofabed in Living Room. Ski Storage Entry. Free WiFi. Free Long Distance. Can also be rented with 2 BR Powderidge 14 for larger family groups. AMENITIES: New in rental, very nice condition. Stocked to the limit, the owners have thought of everything. Arrive to high quality linens, plenty of towels, paper goods, soaps, detergents. Complimentary full bag of STARBUCKS Coffee for you. Popcorn for the kids. LOCATION: Powderidge 8 faces Camp 4 Trail, a Novice run leading to the entire mountain. Powderidge Ski Lift is across the front yard. On the North End of the main ski terrain. Easy to shuttle to the Village, or night skiing at Silver Creek. As "ski in / ski out" as you can get on Snowshoe Mountain. 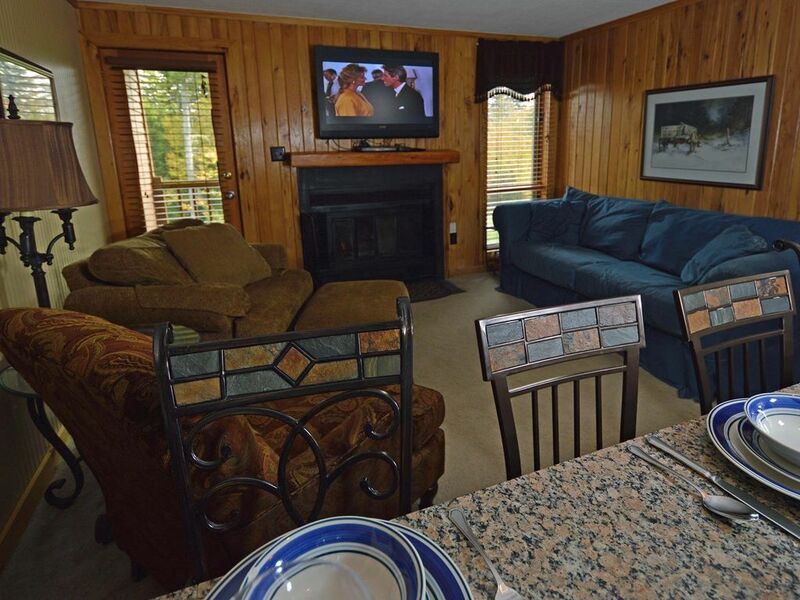 ENJOY: Powderidge 8 is as comfortable as a ski chalet gets with a cozy wood fireplace and awesome views of the mountains. Excellent for a couple with up to 2 children. Very appealing for a romantic couple on their winter holiday together. Picture Perfect ! This is a great location! Truly is ski in and ski out and the bed was very comfortable. Perfect place for couple. Nice view of the ski trail. Would rent again. Would give 5 stars, but pull out bed mattress is very uncomfortable. Time to upgrade!! Nice clean well managed place to stay at Snowshoe! Thanks for a great time!